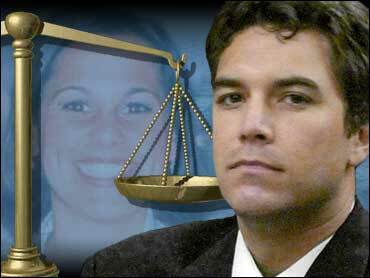 Scott Peterson offered his own theory of what happened to his pregnant wife within 24 hours of her disappearance, the lead detective testified Monday at Peterson's double-murder trial. Modesto police Detective Craig Grogan said Peterson theorized "that she had been wearing jewelry that she inherited from her grandmother and that he'd seen her wearing it on that morning, and when she went into the park a transient had robbed her." Grogan conducted a three-hour, unrecorded interview of Peterson on Dec. 25, 2003, a day after Laci Peterson was reported missing. Prosecutors allege Peterson killed his eight-months-pregnant wife on or around Dec. 24, 2002, in their Modesto home, then dumped her weighted body into San Francisco Bay. Defense lawyers maintain that someone else killed Laci after abducting her as she walked the couple's dog around the neighborhood. Grogan in other testimony shed light on why police focused on Peterson early in the investigation. The detective said Peterson's alibi couldn't be immediately corroborated, and that he was the last person to have seen Laci. Grogan said it also was suspicious that Scott Peterson washed his clothes immediately after returning home that morning. "That led us to believe that possibly a cleanup had occurred at the house," he said. Grogan said it was Scott Peterson's story and "unusual" behavior that led police to seek search warrants for his home and warehouse, where he stored the boat prosecutors allege he used to dispose of his wife's body. Grogan said he grew even more suspicious of Peterson when he searched the warehouse and discovered concrete residue on a boat trailer and five circular-like voids in the cement dust. Peterson told police he made a cement anchor at the warehouse for his boat. Prosecutors claim Peterson made five cement anchors, only one of which was found on his boat. They allege he used the other four anchors to sink his wife's body. Earlier Monday, Scott Peterson's lawyers continued their attempts to show that police ignored important leads that could have pointed suspicion elsewhere. Detective Ian Frazer, of the East Bay Regional Park District police, testified about the discovery of Laci Peterson's remains along a rocky shoreline. On cross-examination, the questioning turned quickly to a large plastic bag found near Laci's remains. Defense lawyers have suggested the plastic may have had something to do with Laci's death, although an earlier prosecution witness testified there was no blood or tissue found on the plastic. Geragos noted that Frazer stated previously, outside court, that he and another officer detected a "decomposition" smell on the plastic. Geragos noted the detective was scheduled to testify last month, but the revelation about the smell, provided to defense attorneys before Frazer's testimony was to begin, led to a several-day delay. The delay was due, Geragos said outside court at the time, to "potentially exculpatory" evidence. Frazer testified he told Modesto detectives about the smell before the trial, but Geragos noted that no mention of the smell was found in any Modesto police reports. "Obviously somebody thought (the plastic) was significant, right?" Geragos asked. "That is correct," Frazer said. "I believed there might be a connection." Richmond police Detective Jeffrey Soler testified Monday about the discovery of the fetus near the bay shoreline. He was also present during the autopsy. Geragos seized on the fact that authorities discarded the towel used to collect the remains, counter to most police protocol to save such items for possible evidence. He also noted that the coroner was unable to determine a cause of death or how long the fetus might have been in the water, and that the coroner's opinion was that the fetus was full term. Defense attorneys have argued the child was born alive, implying Peterson couldn't be the killer, but prosecutors maintain the child was expelled dead from the woman's decaying corpse.